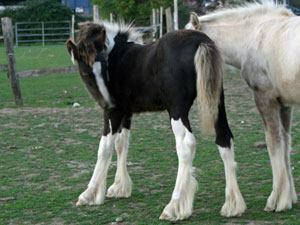 Below you will find the current Colts that Gypsy Horses have for sale. If you do not see a suitable horse, please do not hesitate to contact us and we will endeavor to source your requirements. Chunky smoky black and white colt to make approx 13.2hh out of Coates Secret Shades and by the tank, Coates Tickled Pink. Blessed with his handsome looks and super sweet personality he will make a super addition to any home! He can be gelded prior to leaving us if requested at additional cost. Sire shown in last pic.